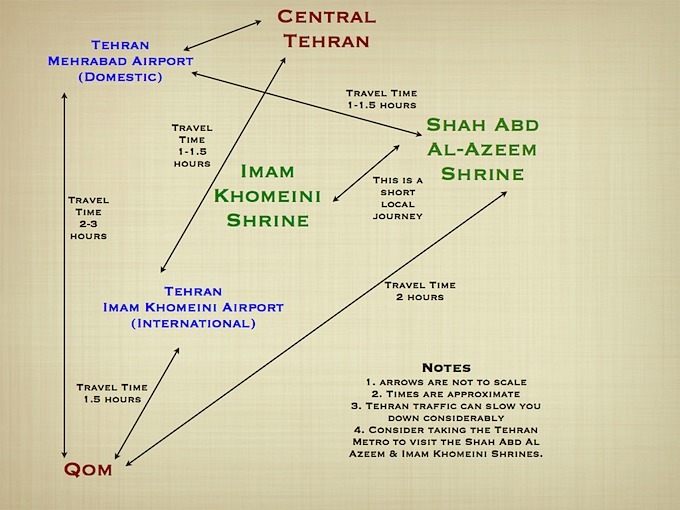 This diagram shows Tehran in relation to its airports and two shrines. The airport close to Tehran, is Mehrabad, and is used for domestic flights. 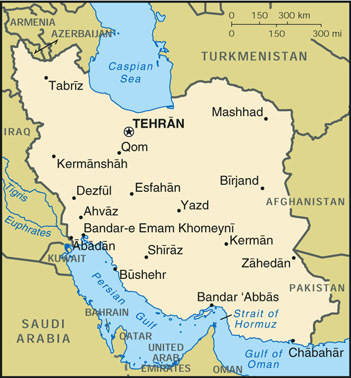 The green circle closest to Tehran and immediately to its south is the Shah Abd-al Azeem shrine. Between this shrine and Imam Khomeini International Airport is the Imam Khomeini Shrine. The travel time between IKA airport and Tehran is about 2 hours. As you can see, it is possible to take in these two ziarats on your way to central Tehran and/or Mehrabad airport. You should note though that Qom lies in the opposite direction. This is the main site for train travel within Iran. Most people will arrive on an international flight into Tehran, they will then go to Qom, come back to Tehran for an internal flight to Mashhad. In order to go back home they will then go from Mashhad to Tehran. Personally I find that pretty tiring, especially since the internal (Mehrabad) and international airports (Khomeini) are different. I would recommend what I did on my last trip, which was to take an international flight out of Mashhad. You can of course enter Iran from Mashhad and leave from Tehran. Qatar Airlines and Gulf will let you do this (but I don't think Emirates will). Of course both options will involve changing planes in either Qatar or Bahrain (for example). But my flight change in Bahrain only involved walking around a small terminal - easier than Tehran traffic. Whenever I have gone, it has been via Dubai, because I use Emirates to fly to the Far East. Emirates arrive at Imam Khomeini Airport (IKA) – though other airlines may not do. If your airline arrives at Mehrabad note that this is the old airport and now generally used for domestic flights. This airport is closer to central Tehran than the international airport (IKA). You can also enter Iran from smaller regional airports, the queues etc. at Shiraz airport will be much smaller than in Tehran. It is possible to get flights to Shiraz from Dubai (Terminal Two). For direct flights to Mashhad, Gulf Air have a flight to Bahrain (twice a week) and Qatar airways also fly to Doha (3 times a week). This is 35km south of Tehran and is used by most international flights. Mehrabad (for internal flights) is towards the west of the City, it is only possible to travel between the two by taxi. You should allow an hour to get to the airport from destinations within Tehran. For internal travel it should be possible to buy tickets once you are in Iran (hotel staff will tell you the address of a good agency). I have never had a problem with flight availability, but I have always travelled in the off-peak season. In the Transport section of this site is the name and address of a travel agency, it may be possible to book with them while you are still abroad. My experience in 2008 was that my trip coincided with an Iranian holiday and I could not get the exact times that I wanted. The train station is at the south end of Valiasr Ave. (there is information in English). See the rajatrains link on the left for further information. There are frequent bus services between Tehran and other major Iranian cities. From Imam Khomeini Sq. ask for 'Rah Ahan'. In Tehran, the office for Iran Peyma (the largest bus company) is on Ferdosi St., near Ferdosi Sq. (6671 9857). To go to Mashhad from Qom, I recommend taking a taxi very early morning to Tehran. In 2008 I paid US$10 for the Qom/Tehran trip (I was going direct to Shah Abd al-Azeem). As far as I can tell, the Iranian couple with me paid about 20% less and there were two of them. But it was still cheap bearing in mind it is a good 2 hour journey. My Tehran-Mashhad flight was at 2300. So I left Qom at 4pm arrived at the Shah Abd al-Azeem shrine at about 6pm and stayed until about 8pm. I arrived at the airport before the check-in counter opened at 9.30pm. You can then take the flight to Mashhad from the domestic airport which is in Tehran. The return flight should not cost more than £40 (approx US$60). But you will either be travelling in a Tupolev, or an old Boeing/Airbus. The train option is possible, takes about 12 hours and I’ve never done it. At Mashhad airport tell the taxi driver to take you to the Attrak Hotel (or whichever one you choose). He will ask if you have a reservation etc. say yes you do. He will try and take you somewhere else, but if you insist on where you want to go he will do as you say. The Attrak is very close to the harram and most importantly does not involve crossing any roads. The restaurant is nice, clean and relatively inexpensive. In 2007 we paid £67 / US$100 per night (in total), for a 2 bedroom apartment for 5 adults and 3 children. The most we ever paid for a meal at the hotel was £27/US$45 (for all of us). For one person a meal came to around 10000 which is about US$12, which was expensive for Iran, so you can definitely eat more cheaply outside. The Metro is new and has 19 stations. The following website shows how people can head south from Tehran by car and then take the flight to Mashhad. This involves driving from Tehran to Qom, onto Isfahan and then to Shiraz. For some people this may seem to be easier than the endless waiting for aeroplanes, plus you can see the towns and cities en route. In order to work out when you'll visit the key locations, it can be useful to have an idea of where they are in relation to each other and also how long it takes to travel between them. I've drawn the following schematic, which I hope helps.